Market Opportunities: Will eSports be a GameChanger for Squash? A couple of months ago, I attended a seminar hosted by MIT Enterprise Forum in Cambridge, Massachusetts on “The eSports, Gaming and Blockchain Technology Revolution,” sponsored by the law firm of Hamilton, Brook, Smith and Reynolds. My prior limited knowledge on the subject matter, enabled me to takeaway that eSports is another means to amplify the sport of squash in a crowded sports and entertainment market with short-attention spans from fans, viewers and sponsors. Though, squash was not selected for inclusion in the 2020 Olympics in Tokyo, the door remains open for the World Squash Federation to make its bid for the 2024 Olympics in Paris and failing that the 2028 Olympics in Los Angeles. Over a 26-year span of immersing myself in the global squash community through various roles as an amateur player, volunteer, coach and administrator, I, along with the more than 20 million squash players worldwide, wish to see the sport of squash designated an Olympic sport by the International Olympic Committee. Many (including non-squash players) consider squash to be a “true-sport,” unlike “eSports,” which has recently become a multimillion dollar industry attracting major sponsorship. The target customers of eSports are mostly young people, but the industry also has the potential to reach stay-at-home parents, “differently-abled” athletes, career professionals-in-transition and senior citizens with extra time on their hands to participate in leagues and tournaments. In recent years, the Professional Squash Association has made limited attempts to license squash video games to bolsters its marketing efforts to capture the “eye-balls” of both current and potential squash fans. My prediction for 2019 and beyond is that, if there are any serious technologists, publishers or members of the gaming community, who possess the know-how to develop, market and sell a world-class gaming squash product (without violence as the premise which in the case of squash is a gentleman’s sport) there is a good possibility for a win-win of squash’s inclusion in the Olympic Games as well as developing a profitable eSports business leader. eSports will never be able to replace the skill, athleticism and mental fortitude that the real sport of squash requires but it can help capture the public’s sporting imagination to expand squash’s audience. 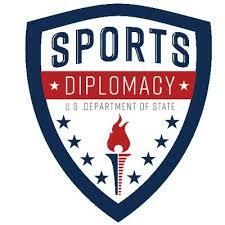 Sports Diplomacy: Effective or Not in Promoting Foreign Policy? My Bowdoin 20th class reunion will be held in May/June 2019 and as such I’ve been reconnecting with staff, students and alumni at my alma mater. Any former government and legal studies majors and the general public may learn from a Distinguished Lecturer in Government Bradely Babson’s course “The Two Koreas and Geopolitics of Northeast Asia,” class podcast held back in May 2018, by current Bowdoin students Tim Ahn ’19 and Sam Jablonski ’18 on the role of sports diplomacy in the Koreas. The recommendations set forth by researchers from George Mason University Center for Sport Management are based on the assumption that the “intent of sports diplomacy programs is to create meaningful change in local communities.” Though the costs of sports diplomacy can be expensive and time consuming, I tend to agree with the GMU researchers’ recommendations, since in my own small way I have lived as a volunteer, coach and administrator to play a role in fulfilling the intent of sports diplomacy. Since approaching middle-age, I am learning more about the importance of both physical health and mental health through conversations with educators, artists, entrepreneurs, caregivers and medical professionals. It is really about balancing both and checking in with yourself, a friend, colleague or medical professional, if needed. The advice of a former Jeddah Prep and Grammar School swim coach was to “Keep it Simple Student,” or (KISS) in short which is a coaching philosophy based on avoiding complexity and focusing on doing a few things really well both in and out of the pool. Upon living in Massachusetts, I was impressed by the quality of the track and field at Danehy Park (seen below) which prompted me to remember Mr. Sither, a former Physical Education Teacher. Danehy Park, Cambridge, Massachusetts. Photo Credit: T. Mohammed, 2017. While enrolled at Kodaikanal International School (KIS) in India during the 1990s, our Physical Education class consisted of partaking in what was then called the United States’ Presidential Physical Fitness Award program. This program entailed passing various physical tests in strength, agility and conditioning for maintaining an active and healthy lifestyle. Seen below are my awards from the Presidential Council on Fitness, Sports and Nutrition sponsored by the Department of Health and Human Services. From a a coaching and policy standpoint, the Squash+Education Alliance and other sport-based programs would do well to integrate themselves with the Presidential Council on Fitness, Sports and Nutrition. 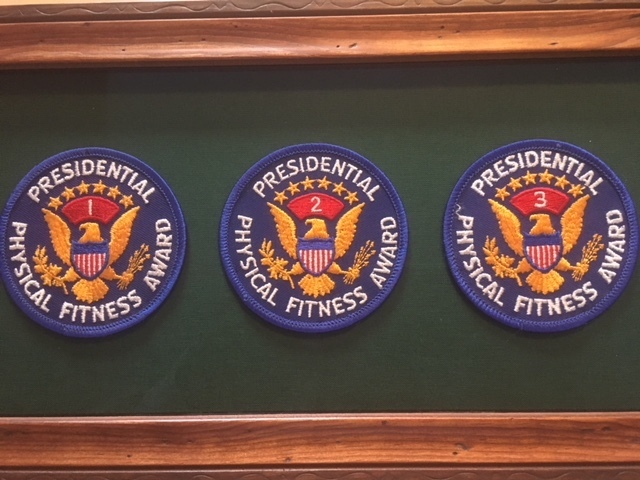 Presidential Physical Fitness Awards earned by Tariq Mohammed. Photo Credit: T. Mohammed, 2018. 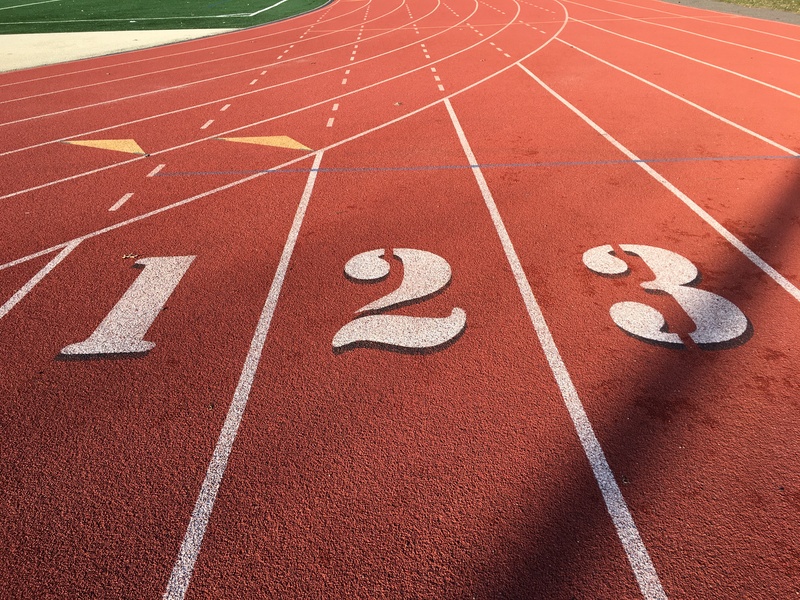 For individuals seeking to maintain or improve mental health, the physical fitness awards can be instructive when having anxiety, paranoia or thought disorders by counting out aloud the numbers, 1, 2 and 3. As I get older I have found that the simpler the activity or exercise the better I feel. This might not work for everyone, but if an individual finds a routine or activity that helps them maintain both physical and mental health then this will stand them in good stead. Not to sound too prescriptive, but from a policy perspective the National Alliance on Mental Illness (NAMI) would also do well to mainstream their programs with coaches, teachers and educators at the Squash + Education Alliance. I am writing based on personal and professional experience and perhaps this will be of help to future student-athletes. Classical Tour of Ancient Greece: Will Squash Ever Make it to the Modern Olympics? I recently traveled to Greece to expand upon my educational horizon and to deepen my understanding of the field of sport for development and peace. Before flying to Athens I conducted basic desk research with guidebooks and on the internet while consulting a few friends who had prior travel experience in the country. Ancient Greek civilization was not something that was taught in international schools back in the 1980s and 1990s in the Middle East but upon completing my undergraduate government major at Bowdoin College, I had briefly studied the work of Aristotle, Plato and Thucididyes. Of course, traveling to Greece more than 15 years later after graduation meant taking my appreciation for the people, place and culture to another level. For 3-days, I was a tour group member of Classical Greece that made stops in Athens, Mycenae, Epidaurus, Olympia, and Delphi. The sites that were of most interest to me were Athens and Ancient Olympia. At every stop and corner there was evidence of historical significance. Learning about the details of all the players and events in the Classical Greece period could make for pursuing another educational degree altogether. This is not something that I am interested in doing at the moment, but believe that traveling is one of the greatest educational gifts one can make for oneself. Visiting the Panathenaic Stadium in Athens was moving because in a way it was a pilgrimage for paying homage to my playing and coaching days while helping to find my place in the world. 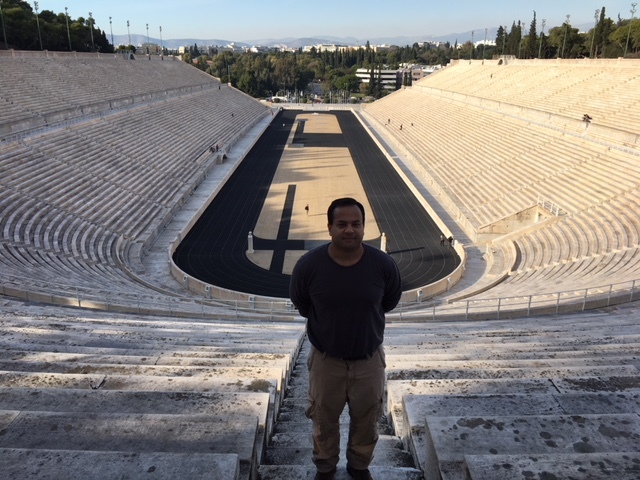 Tariq Mohammed’s visit to Panathenaic Stadium, Greece 2017. Photo credit: Unknown. Visiting Ancient Olympia was of even more significance at it is where the Olympic flame for the Olympic Games are lit. I missed watching the ceremony in Ancient Olympia but was able to tour the grounds and see up close the ruins of this UNESCO Heritage Site. The Greeks had incredible foresight to have built such facilities thousands of years ago, but perhaps could do more to restore or renovate them to preserve such attractions today. Like other members of the tour group, I questioned myself. Why did I travel so far to see ruins and rubbles of dirt? As mentioned my approach was from the standpoint of (a) deepening my own understanding of sport for development and peace (b) being a symbolic advocate for squash in the Olympic movement and (c) being a part of something greater than myself and sharing with interesting travelers along the way. 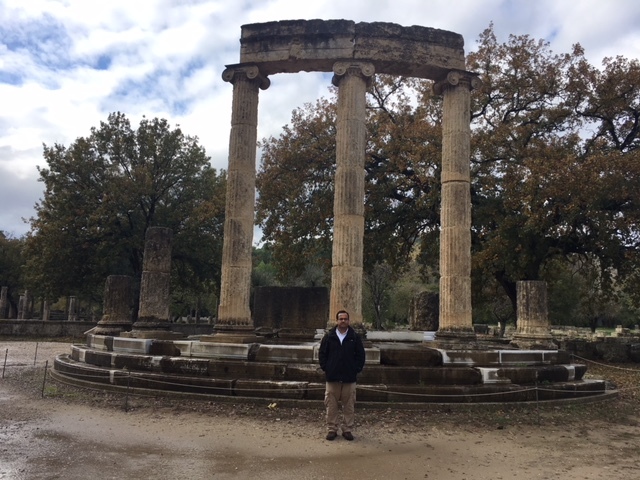 Tariq Mohammed’s visit to Ancient Olympia, Greece, 2017 (Photo Credit: Andy Berbeck). Through my travels and formal education, I have been influenced by several mentors and teachers which led to taking such a journey. I would like to acknowledge their influence as for doing so would provide greater context for my trip. Thomas Hodgson, former Philosophy instructor at Phillips Academy Andover, Denis Corish, former Philosophy professor at Bowdoin College, Alexis Lyras, Founder and Director of Olympus for Humanity Alliance, and Popy Dimoulas-Graham of Charity Republic, Inc. I am grateful to have been able to take the time to make such a trip and explore a new region of the world for myself and advocate for squash’s inclusion in the Modern Olympic Games. It amazes me how my primary and secondary family members have influenced my explorations in sport for development and peace. 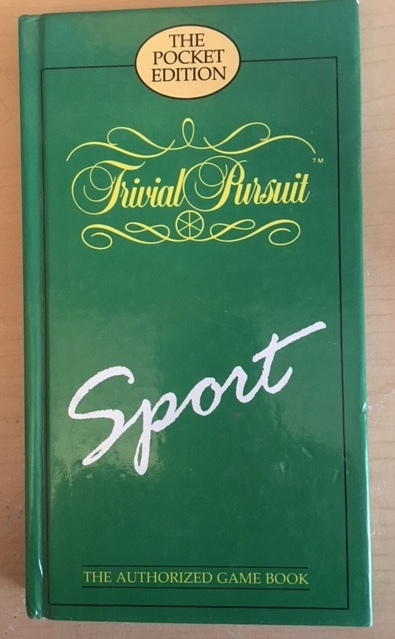 When I was 11 years old, my cousin Rosanna Tharakan gave me a copy of the 1987 Pocket Edition of “Trivial Pursuit: Sport – The Authorized Game Book” by Guinness Books (as seen below). I still have the book in my possession today which has traveled with me from various places of residence. I rediscovered the book after cleaning out my basement. What is interesting about this book is that it can help teachers (which Rosanna and her husband happened to be) and coaches (of which I was trained to do) to be better at holding the attention of young student-athletes during practices and matches. Quizzes: A coaching tool for young student-athletes. One of the most challenging aspects of coaching for me was keeping my practices focused on skills development while motivating students to be a better version of themselves. I found that there were many in-between moments such as bus rides, sharing team meals and warm-ups, where I felt at a loss on how to maximize my time and energy for teachable moments. In other words, practices and matches can get boring fast for both student-athletes and coaches. Master teachers are always good at knowing what to say to a particular student at the right time. 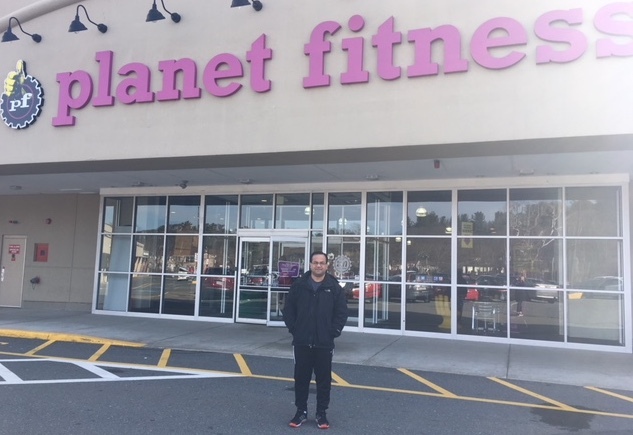 I have still have a long way to go before I reach the master coach level but in the spirit of coach education I thought this blog post would help coaches prepare for the upcoming squash season in New England, so here goes. Many coaches have developed their own repertoires and are always looking to find new ways of delivering them. Quizzing student-athletes on sport or more broadly about current events at school, in the community or national and international news – during warm-ups or long bus rides may help create a dynamic team to go beyond the acts of practicing and playing to one of social action. For example, in recent months the NFL has given us a lot to consider about the safety of athletes, the roles of players and coaches with respect to national anthems and societal issues such as sexual harassment or gender-based violence. The above book and many others like it are great tools for coaches and teachers to foster team dialogues that may lead to improved performances during practices and matches, enhance team unity as well as create positive social development. Good luck coaches and student-athletes! Do you have an Artificial Intelligence (AI) Tennis Coach? Before I learned how to play squash, my Dad introduced me to tennis as a kid. Recently, my Dad, a tennis enthusiast, shared a link to an innovative sport technology product – Coach T. This simple design, but easy to use technological innovation has lots of potential. To learn more about this product, check out the video below from Yanni Peng, Founder of Coach T.
As a certified squash coach who taught squash novices and beginners at Phillips Academy Andover, Concord Academy and Commonwealth School to name a few, I think Coach T could be customized into Coach S (squash). This would not replace a traditional human coach, rather supplement on-court coaching time with portable technology that a student could use on his or her own time. In the meantime, to help make Coach T a reality for tennis enthusiasts, Yanni Peng and her team at Coach T, are conducting a crowdsourcing campaign for the “first AI tennis assistant. To make learning tennis more efficient, flexible and save you money.” I am happy to spread the word about Coach T.